When we moved into our house almost seventeen years ago, the slope in our property was converted into a fruit orchard by my husband, digging every inch by inch. It all started with a few fruit trees; now it is filled with more than seventy exotic fruit trees. Other than citrus, almost all the trees are bursting with fruit. Citrus and guavas yield fruit in winter. How beautiful. Your property is so lush and gorgeous. PLEASE, PLEASE, PLEEEEASSSE...share us MORE DETAILS of how you did it all???!!! I would love to plant fruit trees, but my hubby thinks that they'll just be eaten by those annoying rodents! If I could only actually see/visit your garden...I'd be drooling & jumping up & down BIG TIME!!! Do you allow people to take a tour on your incredible garden? I live in southern California & I would love, LOVE, LLLLOVE to visit!!! I'm just so in AWE!!! I'm just SO IN AWE whenever you post about your amazing garden! it makes me just wanna drool for a long time & jump up & down like a lil kid! please, plllleeeeaaase...share us more specific details about your planting techniques & how-to's. if I could only have a garden like yours,...that would be like heaven! I wanna have fruit trees, but my hubby thinks that those annoying rodents will just munch on them like crazy. do you let "strangers" visit or tour your garden? I live in southern California & I would lllllooooovvve to check out your garden!!! your garden post just cheered up my day BIG TIME!!! It sounds like a good reminder that hard work pays off down the road. What a gorgeous orchard! Nice article...thanks for sharing with us..
That is incredible....Love it. All that hard work and it's beautiful how it paid off. All that luscious fruit to eat and share! 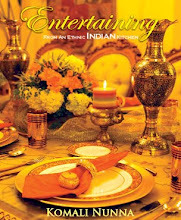 Wow what a lovely one...nice captures..
Are there any vegan recipes in your book? Yes, there are many recipes can be found in both my books. 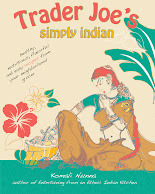 In my second book Trader Joe's Indian, the recipes are marked as vegan, vegetarian and gluten free. Your garden is beautiful and I know you love having your own fresh fruit! What a fabulous orchard, and to think that your husband did it all! Amazing! Thanks so much for giving us a peek. Such a lovely yard. So much beauty.